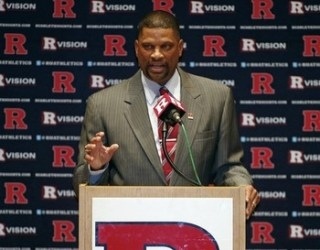 Rutgers new basketball coach, Eddie Jordan did not graduate from college. It is not something to be ashamed of. But one would wonder the reasons why Rutgers would hire a coach who did not graduate from college? The answer is a college degree was not listed as a requirement to be the Rutgers Head Coach. Apparently someone else checked and discovered that a College degree was a requirement to fill an assistant coaching position at Rutgers. Interesting to say the least. It seems Rutgers seem to relish 'Hot Water”. By the way Coach Jordan is enrolled at Rutgers to receive his degree. THE DEAL- SLOW YOUR ROLL!! We think It all about us and not about The Lord. That defeated thinking. The Lord will Slow Your Roll in order for you to get to your plan. It is important that you come to The Lord. For instruction, For Help and to navigate the swift currents of life. You can only control your own destiny by being in tune with Lord. So that you get to your destination not in your own time, but in God's Own time. Yeah, you weave in and out of the slow lane to the fast lane, but guess what! You ultimately get to the same destination at the same time as the two or three cars that you passed along the way. So all the switching of lanes ultimately gave you no advantage. So you did not reach your destination any quicker. You can learn a clear message from lane switching that you can apply to your spiritual life. It is better to stop and listen for the Lord's message. He will speak to you is if ask Him to. Before you take matters in your on hand, simply ask The Lord for direction, “Slow your Roll”. He will lead and guide you through to your destination. It's Throwback Time! 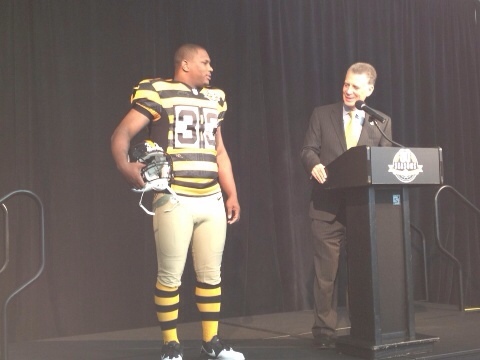 I'm not talking about the typical throwback Jersey, The NFL Football Jersey that the Pittsburgh Steelers or whatever wore back in the Day. Yeah those were the days. But we can't by any means live in the past, no we must fight to focus not on the past, but right here, right now on in the here and now. Today, this moment, this second. Because this time is what really is important to Lord. You can rock your throwback jersey, yeah it's great. But your purpose is to remain in the word, right here, right now. To get there we need to go to the Bible, the Ultimate “Throwback Book”. My friend, it is timeless, the words that were written thousand of years ago are still relevant. You don't need to tune in to the latest reality show. That's a worldly invention. No, we all need spiritual intervention that will move us closer to The Lord. Now that is Powerful. The Lord's Word is awesome and through His Word our steps are ordered by The Lord. My father once preached a sermon entitled Looking Back/Only The Strong Survive. The title came from a hit single from Jerry Butler 1969 hit entitled “Only The Strong Survive” He borrowed the titled for the text and body of his sermon. Though it was a secular song, the words were meaningful. The song focused on how a mother consoled her son, after the girl that he loved left him. She told her son there will be a lot of trouble in your life, but just hold out and everything will be alright. Crying your eyes out, cause the girl that you love is gone. Well its going to be,its going to be, a whole lot of trouble in your life. Listen to me boy, get up off your knees cause only the strong survive. That what she said, Only the strong survive. Hey you gotta be strong, you gotta hold hold on. There's a whole lot of girls looking for a good man like you. Ah but you will never meet them if you give up now and say your life is through. The sermon touched on the key point that we need to be “Strong” in the Lord's will and in his word. “Survival” means that we need to be over comers in this fallen world. To learn to live above our circumstances as we make our way through life's pitfalls and setbacks. We need to have Jesus love and care in order to weather the storm and have the reality of survival through Jesus Christ. Yes only the strong survive through Jesus Christ and Almighty God. John 3:16- For God so loved the world that he gave His Only Son, who ever believes in him shall not perish, but have everlasting life. It is all about the Journey. Where we are headed and what we learn along the way. That is the gist of it all. You see the journey gives us valuable insight that leads us and guides us to our destination. Yes this information can be stored , reviewed, and archived for future use. That is the beauty of it all.The wise traveler understands this and more importantly embraces the experience. Often our destination changes our core focus as well. Perhaps God's chooses to lead us down a different path because it is in His will. The takeaway is to embrace the Journey, understand the benefits and open your eyes and ears to learning as God moves us toward His will. Voting Rights Act- KeepYour Eye On The Prize?? Keep Your Eye on the Prize. A civil rights staple. It kept the Freedom riders and workers hyped and optimistic, in the face of death. These workers went through all manner of persecution, particularly for the right to vote. The Voting rights act protected black voters who were subject to poll taxes and literacy test. Once again the Supreme Court steps on the side of the line they should not dare to step. President Lyndon Johnson is turning over in his grave. You remember this is the same Supreme Court that put President Bush in office. At least Bush had the courage to support the Voting Rights act. Now they have unleashed rampant racism across the south and anywhere else racism still exist in other parts of this country. The legacy of Martin Luther King was tarnished with the Supreme Court's ruling today. Republicans and Tea Party dignitaries are partying tonight. You see this act stomps on the blood and sweat of countless Civil Rights workers who were killed fighting for Freedom. This ruling will set this country back 75 years. Adversity is part of the evolution. Part of the process that we must go through to reach the prize. Adversity molds and shapes us. Adversity brings out the best talents that the Lord has given us. You know the concept, whether you realize it are not. The reality is you got to do more in order to become the person you are destined to be. That’s our reality. Yes that is our focus. God already ordained it for you and for me. So we’re in a fight. Its a fight that we can win. It is a fight that is promised to us. We must do this for God today, because the reality is tomorrow is not promised to us. God wants us all to be all that we can be in Christ and afterwards all the resulting blessing come right from HIM. Think about it world class basketball players have to put in the time, no matter what God given talent they may have. They have to work on the weaker parts of their game in order to remain competitive. They must be fearless and relentless in order to overcome deficiencies in their game. That’s that way life is. You have to become a willing student to reach where the Lord wants you to go. You can’t think or believe that you know everything there is to know. That you got it all going on and you have the confidence to move through any situation. You know what, you’re only human. You are limited. Humanly limited. But God wants you to fight. God wants you to live up to your legacy. So when you are in a real fight, it will not be pretty, know you must dig in and reach for the resources that God has given you. Don’t give up listen to the Lord and most of all fight this fight for the Lord and put on the full Armour of God. He will lead you through. You Got THIS! You fight this fight for the Lord, because adversity is merely a warning sign that blessings are right around the corner. Adversity is a sign that the enemy wants to steal the prize from you. He knows if you give up, you will never reach your prize. Don’t let the enemy hoodwink and bamboozle you. No, you’re better that. Don’t go out like that! You Got to Fight! Keep your eye on the prize and keep on Fighting. Claim the prize by fighting through adversity. 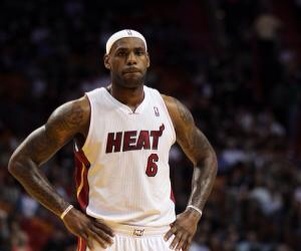 LeBron James seems to be in a perpetual state of frozen animation when playing basketball. Don't get me wrong he's a brilliant player and he possessive wild skills. The problem is we do not understand why he is not consistently taking over the game. Sometimes he appears lost even though he is probably the best player on the planet. Yes LeBron James seems to be someone who really has a problem being consistent in how he approaches the game. Yet despite this, he is an outstanding player and that's something that we all have to come to terms with. Yes many hate him for having the gall to say he was going to take his talents to Miami but we must understand this is truly a talented basketball player. So that is the LeBron James we know. Sometimes he's there. Sometimes he gives you maximum effort and sometimes when he's on the big stage he seems to freeze up. Probably it is psychological I can't really tell you why but it seems to happen quite often. No we can't get into LeBron James' head. That is an exercise reserved for the experts, but we can ponder why he seems to disappear in some circumstances. But maybe LeBron James' coach can tell you why he seems to have a photographic memory. A great memory of plays and situations and how the play is likely to turn out. James looks at his ability in two ways. “Sometimes it works great, sometimes it doesn't,” he said. “Sometimes it can cloud my mind too much and I get to thinking about the game too much instead of just playing. Sometimes I'm able to put myself in situations that are better for me and better for our team by knowing what happened before. It's a beautiful thing. You know when there is no road map or GPS to follow. You can't use your cell for direction, after all it's not fully charged so the GPS is not trustworthy. So here we are trying to figure out the direction of life. To top it off the problems pile on. It seems they are never ending and it seems you don't have the strenght to carry on. What slips our mind is there is a purpose to the misdirection that seems to confuse our earthly minds. That's what makes God's work so beautiful in our lives. You see our life is a work in progress and God is shaping us in the mist of the trial. You know He already knows where we will in up. It is already written in the Book of Life. But our life is a script that must play out. It is important. Trust me, God knows. He only ask that we look to Him in the mist of the trial. Trust Him! He will guide you through this episode.